Terrain and its neighbors invite you to Oak Park on Sunday, September 15th to celebrate two years of dedication to infusing suburban space with Contemporary Art. Utilizing multiple homes on the 700 Highland Avenue block, nine artists have created site-specific interventions for this month long event. 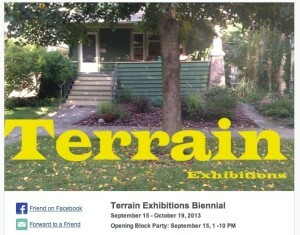 Founded in October of 2011 by artist Sabina Ott, Terrain is a public exhibition space in Oak Park, IL. With the help of Assistant Director, Chelsea Middendorf, Terrain is dedicated to featuring interventions into the conventional landscape of a front yard by emerging as well as established artists who have been invited to create a site – specific work. Artists are chosen for their ability to make artworks that challenge the space between public and private, decoration and function, figure and ground. Visitors, neighbors, school children, teachers and their parents are exposed to challenging contemporary art, offering the experience of discovery and surprise to the community. Terrain exhibits work that expands, both, the audience of an artwork and the function of a suburban front yard.